What was once a derelict neighborhood in midtown Oklahoma City is taking on a fresh personality that is beckoning young professionals to call this once-blighted area home. 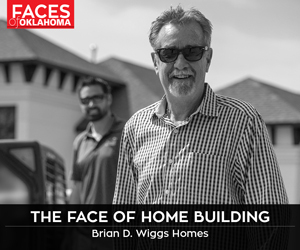 Working with architect Randy Floyd, AIA, Lee Peoples and Emma Rolls built a contemporary home that is encouraging others to take a second look at this area. Floyd, along with her husband, Michael Smith, have long been preservation activists in Oklahoma City. “If there was a protest march about neighborhood preservation, we were in it,” Floyd notes. Now, a better effort than carrying protest signs about distressed neighborhoods is making improvements or removing structures that can’t be saved and constructing modern architectural dwellings. With Floyd and Smith running their own businesses, there is now little time for their previous activism. Smith and Floyd have lived in the neighborhood since 2005, in a 1906 Territorial Victorian multi-family dwelling they modernized. This bold move brought attention to the neighborhood and resulted in Floyd’s design of this home for Peoples, Rolls and their daughter, Amelia. The homeowners had specific needs they hoped Floyd’s architectural design would meet. Among the needs on their wish list were a home fashioned of durable materials in 2,400 square feet or less; a place to cook and entertain efficiently with a sophisticated sound system, providing background music; and a home office where they could work after hours, away from their downtown jobs. They also wanted a large master suite, a space for Amelia that would evolve as she matured, and a swimming pool and private courtyard with decks adjacent to main living areas and as much private outdoor space as possible. What Floyd designed for them exceeded their expectations. She achieved their wishes on a 50-by-140-foot lot in a contemporary home, which includes a two-car garage with a studio on top. The materials used represent the latest in sustainable architecture and design. Among the amenities: maple hardwood floors, aluminum back splashes in the kitchen, marble kitchen countertops, built-in cabinets to conserve space, easy-to-clean, high-grade painted surfaces, and floor-to-ceiling solar shades covering commercial size windows. The home has an expansive feel that brings the outdoors in at every opportunity. A view of the downtown skyline was one of the couple’s wishes; the recently developed Devon Tower was an unexpected bonus. From their neighborhood, it seems the couple can almost reach out and touch the impressive tower. The exterior features red brick that is traditional in this residential area. The interior gray and white color scheme is sparked by orange, rust and chartreuse. “The neutral color scheme gives Lee and Emma flexibility and provides a backdrop for their contemporary art,” Floyd notes. Their bedroom area on the second level is separated from Amelia’s haven by a large, black tile walk-in shower, concealing their closet area. Five steps up from the bedroom hallway is the office/studio area, giving the illusion of a third floor. An adjacent deck offers privacy but affords them another downtown skyline vista. Floyd blended recessed can lighting, cable, track and pendant lights to provide soft lighting. Skylights provide natural lighting, while blackout shades in the couple’s bedroom aid sleeping. Sunscreens float like clouds above outdoor deck areas. A front entry garden is enclosed by plant trellises. “In time, they hope this area will become a sculpture garden,” Floyd says. That indicates Peoples and Rolls have made their midtown home more than a trendy address. They’re hoping others will find midtown OKC an exciting place to live.